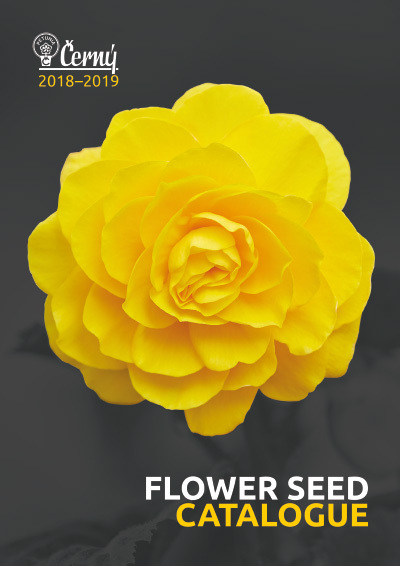 As has already become the tradition, we prepare a new catalogue of flower seeds for you every year and nothing has changed in that respect this year. Efforts to ensure the maximum level of product quality, following new trends and fulfilling customer wishes represent a great commitment for us and also motivation for us to continue and develop breeding work in our company. Let’s stop for a moment and leaf through the pages of the catalogue. Looking at the photos of flowers makes you think that this is not merely a marketing tool, but literally a gallery full of works of art created by several generations of breeders over many decades of painstaking breeding work. It is our pleasure to introduce to you the latest varieties for this season. An absolutely unique product on offer is the Copacabana F1 Tricolour, extending the well-known group of Begonia boliviensis to include a brand-new flower colour which has never before existed in international ranges combining apricot, cream and yellow flower colours. Many of our partners have already included the Copacabana F1 series into their ranges to the utmost satisfaction of their professional customers. Why not also try out the varieties included in our range in the past from the Copacabana F1 series in Yellow, Red, Orange, Salmon and White. The range of colours available allows for a wide range of colourful and very effective combinations. The new mini petunia Petit F1 Red Vein variety supplements the range of colours included in the modern and high-performance group of low compact hybrids with small flowers Petit F1 which was introduced in the past. Just like all of the other varieties in the Petit F1 series, Red, Deep Salmon, Violet and Carmine Rose, the new Petit F1 Red Vein also offers the very best properties that a grower can expect from mini petunias. We are certain that the new products mentioned above will again enhance options for our further cooperation and profit as was for example the case with last year’s introduction of varieties of Begonia interspecific in the Sensation F1 series which literally became a bestseller on our professional market. We will try to extend the range of colours on offer in the near future in such a way that Sensation F1 lives up to its name even more than has been the case until now. We would like to thank you for your cooperation to date and the confidence you place in our work and our products. Wishing you great success in the coming sales season.